RatArt Press proprietor Michael Henninger has been making book art for over 20 years. He has a BA in Mathematics from UC Berkeley and an Master of Fine Arts degree from California College of Arts & Crafts. Additionally, he teaches Book Arts, Graphic Design, Multimedia, and Printmaking at California State University, East Bay where he is a Professor in the Department of Art. RatArt Press was founded in 1988 in Oakland, CA. In 2003, we moved to our current location in Lafayette, CA. We have published over 40 Artist's Books utilzing everything from metal type and letterpress printing to the latest in digital printing. �His creativity and excellence as a book artist are demonstrated by his skillful use of materials and the connection of form with content. His fine craftsmanship points to the attention he gives to details; his books are well made, attractive, and durable. He successfully explores new ways of working and new ideas; each new book is a fully-formed surprise.� � Alisa Golden, book artist and author of Expressive Handmade Books (Sterling: 2005). �[I] have long considered him to be in the front rank of book artists, and outstanding proponent and practitioner �� and �over the years I have found Michael to be a highly articulate exemplar of the artist�s book, and an accomplished and consistently interesting artist.�-- Steve Woodall, Artistic Director, San Francisco Center for the Book. 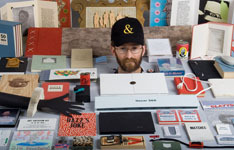 �His playful explorations of game formats, his wry takes on gender identity, the distilled directness and iconic simplicity of his personal stories have marked his oeuvre from its beginnings�--Betsy Davids, Professor of Book Arts, California College of the Arts. �Henninger does not shy away from probing topical and controversial subject matter. He does so in a way that communicates to the average viewer as well as those experienced in looking at and reading artists� books. The mood of his work is also divere, contrasting from the profound to the humorous to the tender � �-- Janice Braun, Special Collections Curator, Mills College.